Don't give up! I am a corporate executive...work in the medical field as an owner of a pharmaceutical company...active...and reasonably fit. I'm 55 years old. I have had a variety of injuries over the years including a series of rotator cuff surgeries. I later found out that, in part, my shoulder problems were related to the lack of exercise and strengthening. I subscribe to a regular work-out regimen now and while not the same as I once was, I regularly play golf and wish I had developed an exercise program before having had surgery. With all of this as background, I am convinced that strengthening the lower back and buttocks area can help with coccyx pain. In my case, I was visiting a friend's lake house almost 1 1/2 years ago. Upon going into the house, I dislodged a bee nest and in my hasty retreat fell square on my tail bone on hard rocky ground. You know the rest. I experienced pain and after going to my orthopedist, no fracture or irregularity could be found. I was prescribed physical therapy...NSAID's...which I did regularly and the pain continued. I have a chiropractor as well and his electro-stimulation and adjustments helped but the pain would flare up routinely. Mind you, I have never had back pain in my life! I have a friend who has back problems and he recommended (don't laugh) but inversion therapy. 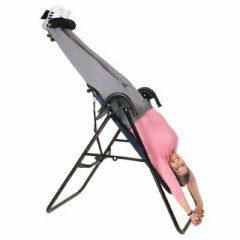 This can be accomplished in a variety of ways...inversion boots or on an inversion table. Simply stated, you lie on a table (like a see-saw)...your feet are locked into position and as you go back you will ultimately "hang" and all pressure is off the lower back and you can almost feel the vertebrae moving. Once you have adjusted, you can do sit-ups and other exercises while "hanging". I do such sit-ups in the hanging position and have coupled this with an exercise I developed where from a chair, I slide my buttocks off the chair and with my legs propped up do a version of the "Cat & Cow or Cat & Camel paying attention to pulling and tightening the buttocks area.